Our own Brian Southwell presented at Frank 2017 on misinformation. Here’s a video of his appearance. A first-person account of The Measure of Everyday Life radio show’s live episode preview at the Duke Coffeehouse from correspondent, Nupoor Kulkarni. Tucked away inside the unassuming entrance of the Duke Coffeehouse, the experience within is anything but. With its vibrant artwork practically coming to life off of the cement walls, on a warm February night, the Coffeehouse provides an engaging space for self-reflection and compelling conversation. The show’s mission – to make social science relevant in daily life – becomes clear in the dimly lit room as host Brian Southwell settles into conversation with Duke University’s Dr. Sarah Gaither. 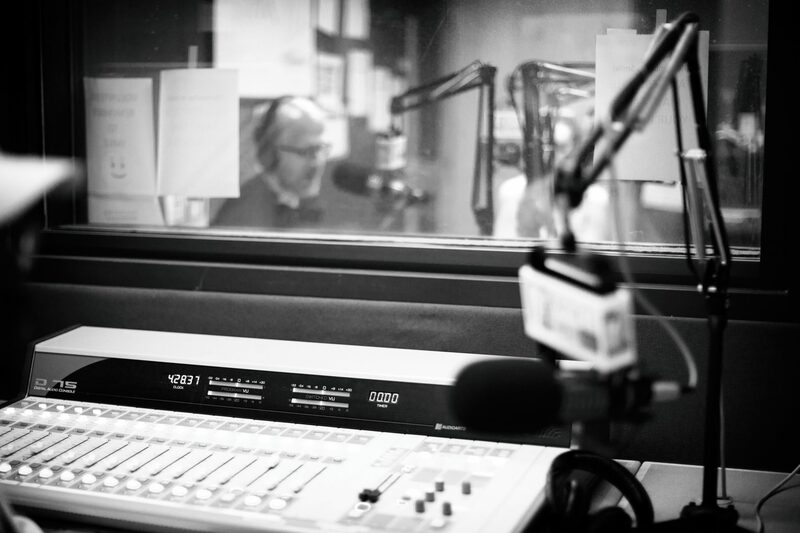 Want a behind-the-scenes look at radio production? Ever wondered how your favorite podcasts are created? Curious how to make social science research engaging? Looking for something cool to do on a Thursday night? If you’ve answered ‘yes’ to any of these questions, please consider joining Duke Professors Sarah Gaither and Brian Southwell, host of The Measure of Everyday Life, as they preview an upcoming episode of the radio show. Sarah Gaither, a professor of neuroscience and psychology, will discuss her cutting edge work on interracial relations and perceptions of racial difference. The event will also include the debut of a story on the refugee experience by Duke graduate, McCall Wells. The preview will be followed by an interactive Q&A session with Professor Gaither. Come get FREE coffee and tea while it’s hot! We’ll see you there. Want to post a flyer about the event? Here is a PDF copy to share and post. You can also share the event on Facebook. This January, we are celebrating two years of partnership with WNCU 90.7 FM. Relying on a public radio budget to translate social science research and theory into practical discussion, in-depth interviews with guests in studio, and feature stories by a range of contributors has been challenging at times but has been worth all the effort. We’ve built a forum for precisely the type of research-informed discussion that is sometimes missing in our contemporary information environment. WNCU has been a welcoming and supportive host and we have greatly appreciated their help as they have built on their considerable expertise as music historians and presenters to develop a comfortable home for discussion of everyday life as social scientists see it. We recently celebrated with a second anniversary episode put together by students in the first Social Science Radio Workshop at Duke University this fall. Thank you to the Social Science Research Institute, Center for Documentary Studies, and Sanford School of Public Policy for their support in making the semester-long workshop a reality. We are delighted to welcome the talented McCall Wells and Marina Poole as interns. You’ll be hearing more from them and several other new contributors soon. Today we handed the microphone to students from Duke University. As we approach our two-year anniversary, we asked the students to select what they thought were the most compelling episodes the past year and record an intro to the segment. Here are some photos of the students at WNCU. 2016 November 18: The “Measure of Everyday Life” taping at WNCU on the campus of North Carolina Central University in Durham, NC.